BRAINTREE, Mass. 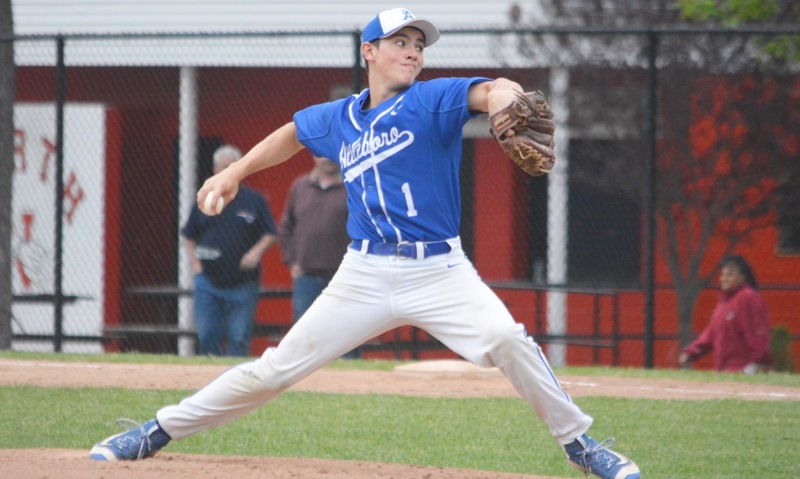 – Heading into the D1 South Semifinal, the Attleboro Blue Bombardiers knew that would have to play nearly flawless if they wanted to upset top-seeded Silver Lake and Gatorade Player of the Year, pitching Anthony Videtto. Unfortunately, Attleboro had things go wrong at inopportune times and the Bombardiers suffered a 3-0 loss to Videtto and the Lakers in the D1 South Semifinal. Silver Lake scored single runs in the first, third and fifth innings while Attleboro was unable to get a base runner past second base. Nate Tellier was strong on the mound in a six-inning complete game effort, tossing a two-hitter with nine strikeouts. But Silver Lake was patient, drawing six walks – three of which led to runs. Attleboro’s Tyler Stowe roped a one-out single in the top of the first inning but Videtto came back, getting a strike out looking and Lakers’ catcher Greg Wozniak fired to second for the double play. A lead off walk from Will Gallagher to open the bottom of the first quickly turned into a scoring opportunity for Silver Lake when he stole second. Dan Collins ripped an 0-2 pitch into right field, bringing Gallagher in for a 1-0 lead. The Bombardiers were unable to capitalize on a lead off walk in the top of the second, grounding in a 5-4-3 double play. And then Videtto worked around a two-out single in the third. Videtto drew a lead off walk in the bottom of the third and quickly got into scoring position by stealing second. The senior then took off for third and the throw from home skipped into third. Videtto sprinted in for the Lakers’ second run as the throw from left sailed high. Attleboro had a base runner in every single inning, including Will Carter reaching second on a one out error in the fourth. But Videtto locked in with a strikeout and a routine grounder to short to get out of the inning. Stowe collected his second hit of the game to lead off the sixth but a line out to center turned into a double play with the throw to first for the out. Silver Lake added an insurance run in the bottom of the fifth inning. Back to back walks to Gallagher and Videtto preceded an infield hit from Collins to load the bases with no outs. After Tellier induced a pop up in foul play to first, Lakers head coach Kenny Tocci elected for a squeeze play. Jack Ruprecht placed a perfectly hit bunt for a ground out RBI, right between Tellier and third baseman Robbie Araujo, allowing Gallagher to scamper in. Tellier struck out the side in the bottom of the sixth, all looking, and gave the Bombardiers the momentum heading into the top of the seventh, and they nearly capitalized. Araujo’s grounder got through at second base for a one out hit. Pinch hitter Nolan Kane took four straight balls to put two on and bring the tying run to the plate. Videtto got a strikeout for the second out, bringing Attleboro second baseman Cam Hochwarter to the plate. Hochwarter connected on a 1-2 pitch, launching the hardest hit ball of the day to left center field but Silver Lake’s Aidan O’Neil made the running catch just mere feet from the fence for the final out. Attleboro finishes the season 13-10 overall, winning seven of their last nine games. NORTH ATTLEBORO, Mass. – Going into its final three games of the season, Attleboro needed two wins to clinch a spot in the state tournament. On Monday night, under the lights at Community Field, the Bombardiers threw their ace, senior Nate Tellier, against North Attleboro in the annual Blue and Red Cup game. 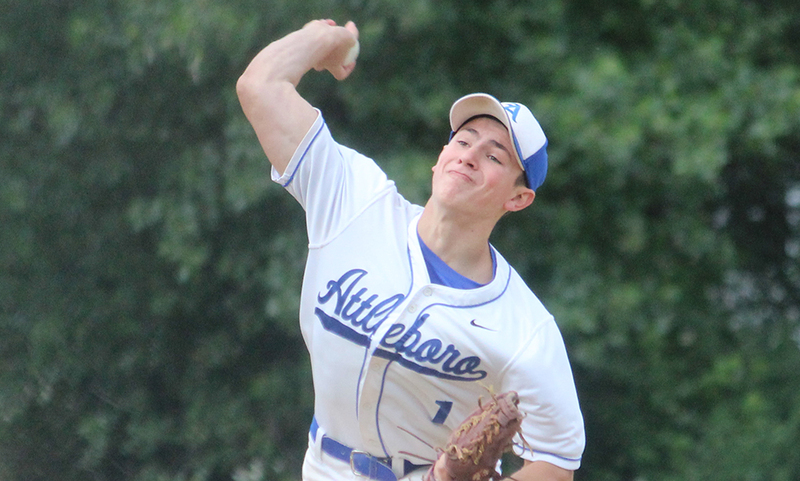 Attleboro needed a solid start from its top pitcher. Tellier went way beyond solid; he gave the Bombardiers historic. The UMass Dartmouth-commit tossed a no hitter against the Rocketeers, striking out 16 over eight innings, including a stretch beginning in the second inning in which he fanned 11 of 12 batters that he faced. With a dominating fastball and a curve that he could throw for strikes, Tellier limited North to four base runners: lead-off walks in the first and second, a fielder’s choice in the first, and an error on a bunt in the sixth. 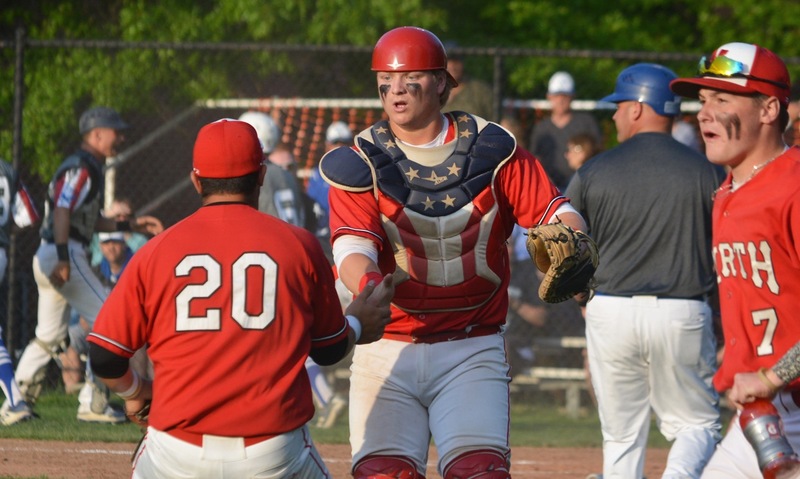 Tellier’s effort was matched almost pitch by pitch by North starter Andy Katch, who threw seven shutout innings of his own before allowing an eighth inning rally that would produce the winning runs for the Bombardiers, as Attleboro claimed the cup with a 2-0 extra innings victory. North had its best chance in the bottom of the sixth. Tobin called for a bunt from nine-hitter Zach Rofno and he placed it down the third base line. If Tellier’s throw had been on line it would have been an out, so it went down as an error on the pitcher. Rofno stole second and moved to third with two outs on a grounder, but he was stranded when Tellier got Zach DeMattio to bounce back to the mound. Will Carter lined a two-out double to left center, bouncing it into the stands that line the warning track, but Katch got Robbie Araujo to ground out to end the inning. In the bottom half, Tellier made quick work of the Rocketeers with two strikeouts and a grounder to first. 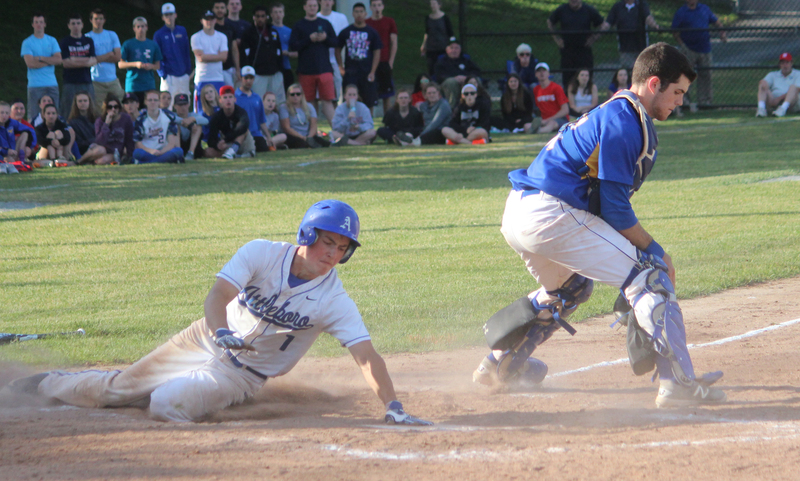 The game was scoreless into the eighth, but finally Attleboro got something going. Pinch hitter Nolan Kane worked a lead-off walk and after Katch struck out Brent Cook, No. 9 hitter Cam Hochwarter smashed a ground-rule double to left to put two in scoring position. Jon Dunn followed with a clutch single to left that scored both runners. An error and hit by Tellier would load the bases but John O’Donnell came in to relieve Katch and got a line drive and a fly ball to center that Kyle McCarthy made an excellent play on despite barely being able to see it in the limited Community Field lighting. Tellier did not need any more than two runs. He got a comebacker for the first out and then, facing a pair of pinch hitters, he overwhelmed the final two batters with his fastball that during the game the North coaches labeled the fastest they have seen this year. In his last outing he threw 136 pitches and Tellier admitted that his arm was still sore from that last start. He took some Advil on Monday morning and that seemed to help a little. Then he went and threw the best game of his career. In the midst of the pitcher’s duel and the drama of the scoreless game, many people were unaware that Tellier was working on a no hitter as the final inning began (this reporter included). In fact it was not until he was about to take the mound for the eighth inning that Tellier even became aware of what he was working on. 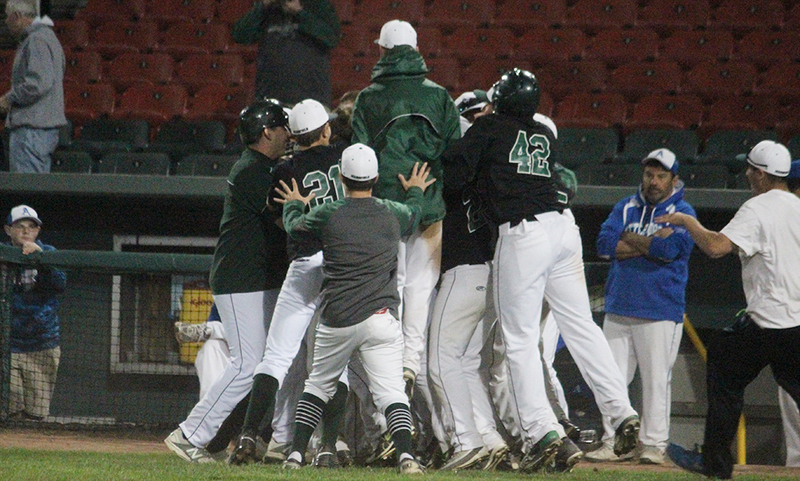 “I was just focused on getting outs up until the eighth inning and then when it came around I was like wait,” he said with smile, still soaked from the water his teammates dumped on him in the postgame celebration. Tobin was proud of the way his team competed on Monday with nothing more to play for than the trophy and a chance to beat its rival. He praised Katch for giving his all and felt bad that the senior could not have been rewarded for his great start. Attleboro rode a historic start to a win on Monday and will go into its final two games needing one more win to clinch a postseason berth. Bosh said, “These are games all year that we’ve lost where it’s close late and there’s a bad break or an error or a base hit…That’s the kind of win we haven’t gotten all year. Attleboro (9-9, 8-7) will travel to Frothingham Park on Tuesday to face Oliver Ames. North Attleboro (6-12, 5-10) will face Foxboro. TAUNTON, Mass. – The pitcher’s duel between Attleboro’s Nate Tellier and Taunton’s Luke Figueira certainly lived up the hype. Two of the top pitchers in the Hockomock League went back in forth, Figueira landing a punch the top half only for Tellier to answer with a counter punch on the mound in the bottom half. While both pitchers were engaged in a heavyweight battle, both offenses struggled to get just about anything going, combing for three hits total. 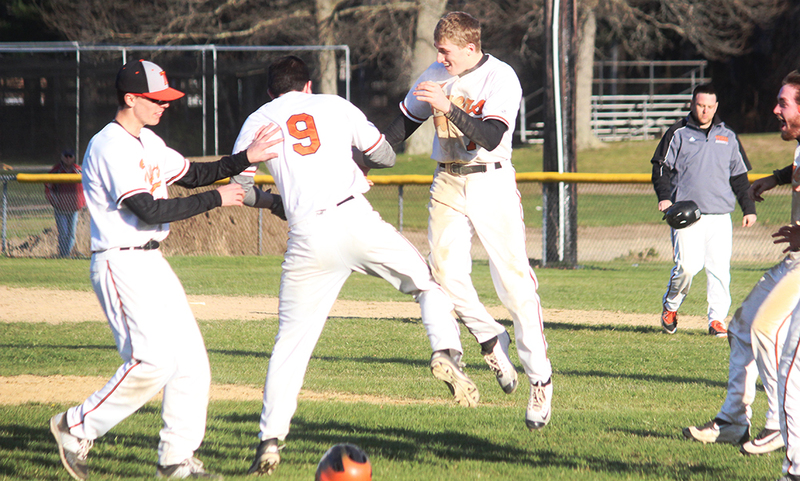 In the end, it was a walk, Taunton’s lone hit and an error in the bottom of the 8th inning that allowed the Tigers to walk off with a 1-0 over the Bombardiers. Taunton went seven innings without a hit but finally got one in the bottom of the eighth inning. Junior William Emerson battled to draw a lead off walk and advanced to second on Matt Machado’s sacrifice bunt back to pitcher Matt Callahan. Senior Brendon Mazerolle reached on a hard hit infield single to put runners on first and second. Callahan responded with a strikeout for the second out. Senior Max Bowden then hit a hard hit grounder up the left field line was squirted through at third base and rolled slowly into left field. With two outs, Emerson was running on contact and came around to score the winning run. Attleboro had one of its best chances in the opening inning when a one out walk preceded a single and a fielder’s choice to load the bases. Figueira was able to get his third strikeout of the first inning to escape the jam though. Taunton’s lead off batter reached in both the first inning (Machado via a walk) and sophomore Joe Manchester (via an error) but both times, Tellier came up with a pair of strike outs to walk away unscathed both times. Figueria (four pitches) and Tellier (13 pitches) each breezed through the third inning. Bowden reached on an error to lead off the fourth and moved to second on a sac bunt from Manchester and to third on a wild pitch. But Tellier once again closed the inning with a strike out to escape. Attleboro’s Tyler Stowe reached on a one out error in the fifth and moved to third after a stolen base and a ground out to short. Figueira closed the curtain on his performance by inducing another 6-3 groundout. Tellier got into a little trouble in the bottom of the sixth after a hit batter and an error put runners on second and third with two outs but the senior got Manchester looking with his 98th and final pitch to get out of the jam. In relief, both Taunton’s Bowden and Attleboro’s Callahan was very strong. Bowden had 1-2-3 innings in both the 6th and 7th but ran into a little trouble in the 8th inning. After getting a strikeout to start the top half, an infield error allowed Cam Hochwarter to reach. Nate Tellier then reached on another infield error to put runners on first and second. Patrick Collins’ blooped Attleboro’s second hit of the game (and first since the first inning) into right centerfield. After a bobble from Machado, Figueira – who shifted to right field after coming off the mound – rocketed a throw to home to gun out Hochwarter at the plate. Bowden then induced a grounder to Mazerole at short get out of the inning. Tellier pitched six innings of no hit baseball, struck out 10 with just one walk issued. Figueira tossed five scoreless innings, allowing just one hit and struck out six. Neither pitcher was involved in the decision. Taunton baseball improves to 2-1 overall and in league play. The Tigers will be back in action when they travel to Coyle & Cassidy on Monday in the all important City Championship. Attleboro (1-3) will look to bounce back when they travel to Sharon on Tuesday at 11:00AM. ATTLEBORO, Mass. 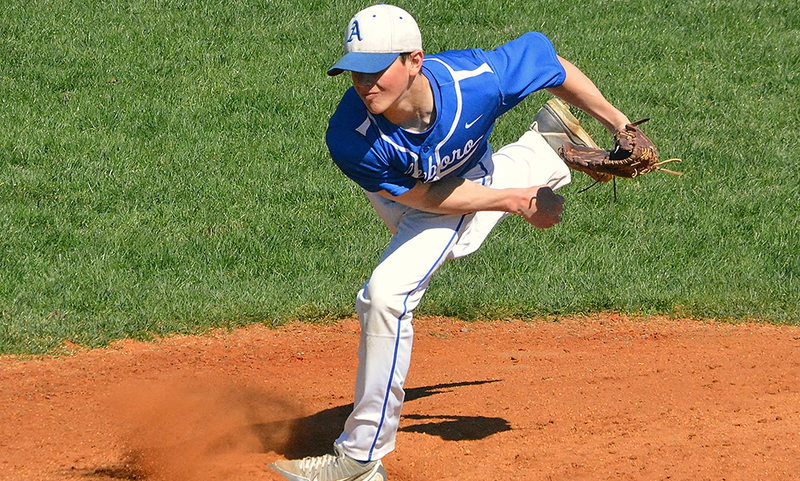 – The Attleboro baseball team traveled a couple of minutes across town to Beach Field to face rival Bishop Feehan on Saturday afternoon. Weather had forced a delay to the start of the season for the Bombardiers and had severely limited their ability to get outside and practice. 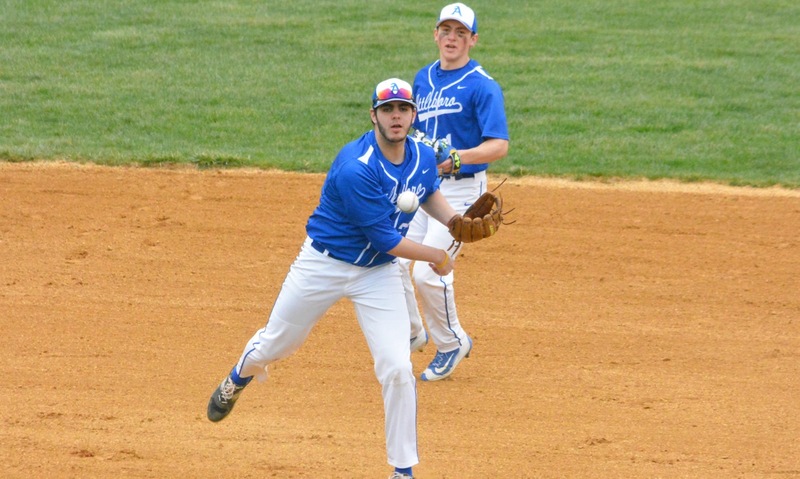 On Saturday, Attleboro looked like a team that was seeing its first action of the spring, especially at the plate where the Bombardiers were limited to only four hits by a pair of Shamrocks pitchers, and fell 5-1. Junior Matt Callahan made the first start of his varsity career, giving up three runs on five hits over four innings of work. Although Callahan took the loss, Attleboro coach Matt Bosh pointed to the lack of offensive punch as the main reason for falling to 0-1 on the season. Attleboro had a chance in its opening at bat to get on the board. Cam Hochwarter led off with a single to left but with one out was forced out on a grounder by Nate Tellier, who took second on a balk. Patrick Collins followed with a walk but Nolan Kane grounded out to short to end the threat. Jon Dunn reached on an error in the top of the second but was caught stealing third on a missed bunt attempt and would be the last baserunner for the Bombardiers until the fifth inning. Feehan starter Zack Newman settled down and struck out four over 4-1/3 innings. Meanwhile, Callahan got off to a great start. He needed only 11 pitches to get through a perfect first and 11 more in the second in which he allowed just a two out single. In the third, Feehan took the lead. After Callahan got the first two hitters to ground out, he hit lead-off batter Matt Everton in the foot. Jake Bamford followed with a single to right moving Everton over to third and then Jason Medeiros drilled a pitch into the gap in left center plating both runners. The Shamrocks added another run in the fourth when Reid Spears, who had singled with one out, raced home from third on a wild pitch. Attleboro finally got something going in the top of the fifth. Dunn singled to center, his second time reaching base in as many plate appearances. John Burns followed with a single and Dunn took third. Brandon Galvao would plate the Bombardiers lone run with a fielder’s choice to short and advanced to second when the ball was thrown away. Newman walked pinch hitter Dylan Maskell to put two on with one out. Pat Cashin came in from shortstop to take over on the mound and he promptly induced an inning-ending 4-6-3 double play from Hochwarter to get out of the jam. Feehan plated another run off of Maskell in the bottom of the inning, but Attleboro came right back and had the first two on to start the sixth on a double by Will Carter and a walk to Nate Tellier. Again, Cashin made his pitches and Nolan Kane bounced into a double play to end the inning. The Shamrocks wrapped up the scoring in the bottom half. Bamford drove in Jake Bernhardt with a single off Dylan Prout. The ball died in the lengthy grass, allowing Bernhardt to score from second without a throw. Burns got his second hit of the game with one out in the seventh, but Cashin got a grounder and then caught Prout looking on a breaking ball to end the game. Attleboro will not have much time to dwell on it, as the Bombardier will be back on the diamond on Monday against Milford. Bosh is confident that his team will get the bats going.